Accidents happen when we least expect it; they can happen to anyone, anytime, anywhere. I have already proven this on countless occasions. I remember quite clearly how my son was seriously hurt while we were inside a mall. I was buying food from a nearby restaurant, and father and son were killing time outside. While walking, our little boy lost his balance and fell forward. My son’s loud cries sent me scurrying to where my husband and son were, and that’s when I saw my son’s bleeding and swollen lips. We took him to the nearest clinic to seek immediate treatment, and we never allowed him to walk on his own for the remainder of that day. He also had an accident in school when he was 5 years old. After class dismissal, my son would normally stay for a few minutes in the school playground to play with his classmates and other kids. When he arrived home, he went straight to me and told me that his tongue was painful. When he opened his mouth, I saw two parallel cuts on the middle right side of his tongue. It turned out that the slide in the playground gave way when my son hurriedly jumped onto it. I had to take him to the doctor right away to know what can be done about those cuts. I also had my share of accidents, and most of them had to do with taxicabs. Last year, for instance, while alighting from a taxi in front of the building where we live, I lost my footing and fell to the ground. I ended up having a nasty bruise on my right knee that lasted for a week. I also sustained a long cut in my right leg while getting out of a cab; this accident happened five years ago. I don’t quite remember if the metal thing that scraped the back of my right leg was rusty, but I remember seeing a little bit of blood oozing from my wound. That got me worried. I was on my way to visit my obstetrician/gynecologist for my annual Pap smear on that day, and when I finally got to see her, I showed her my ugly cut, and she told me that I should get a tetanus shot to prevent an infection from setting in. I shelled out a hefty sum for the tetanus injection my doctor gave me. In short, I ended up getting hurt and spending for something that wasn’t even my fault. If only I was able to take down the taxi driver’s name and license plate number, I could have reported the incident to Express Solicitors, and they could have helped me file a personal injury claim so that I would be reimbursed for the money I spent for my tetanus shot. Getting into accidents is never a pleasant experience, but I have learned that accidents can be prevented if we will just be more alert and vigilant. I can’t change what has happened in the past, but I can surely prevent these things from occurring again by being extra careful. This entry was posted in Accidents, Injuries. Bookmark the permalink. am such a klutz and i get bruises every too often. 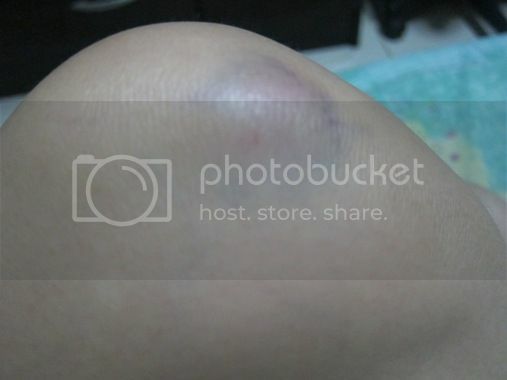 just last week, i bumped my knee on my way down from a carnival ride which resulted to one unsightly bruise. accidents can really be costly, but they do happen in the most unexpected time + place. the least we can do is to always be careful, especially when around our children. I’m accident prone and I hate it when I figure in an accident. Still, I’m lucky that our medical insurance got me covered. accidents really happen even if you feel like you’re careful. tetanus shots are really expensive, thank God for health insurance. ← Have You Tried Auto-Yoga?